In Siberia, a 70-year-old woman received a copy of God’s Word for the first time. Though she wanted to read it, she had never learned to read. The elderly woman prayed and felt God telling her to open the Book and start reading. She obeyed, and for the first time in her life, she was able to read and is still reading! CAM distributes millions of Bibles. This is a wonderful blessing, but . 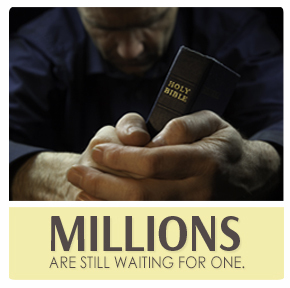 . . millions of believers are still waiting for their very first Bible. Half of the world’s people have never even seen a Bible. At any given time, CAM has requests for over 25 million copies of the Bible (in various languages and countries). At an average of $2 per Bible, we can place copies of God’s priceless Word in many people’s hands. If you want to help distribute Bibles to spiritually hungry people around the world, your help would be greatly appreciated. YES, I intend to help provide Bibles and Christian literature in various countries. A gift of $50 may provide as many as sixty assorted books, Bibles, Christian family magazines, and Bible correspondence lessons.